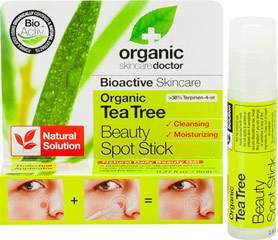 Organic Skincare Doctor Tea Tree Beauty Spot Stick effectively penetrates, instantly assisting in the development of clean, healthy skin. Using bioactive organic Tea Tree ensures that only the purest properties are captured and protected in our pure Tea Tree oil. Each batch is tested to guarantee the efficacy and integrity of the oil which is maximized to levels far exceeding the industry standard.